New in the Flickr Commons this week, a fine portrait of Charles Proteus Steinmetz (1865-1923), a Prussian-born mathematician. He was just 23 when he finished his doctoral work at Breslau; soon after, he immigrated into the United States. As a dwarf with a hunched back and no money, he was nearly refused entry at Ellis Island; but he was traveling with someone who was able to convince the inspectors that he was actually brilliant and rich scientist. He went to work as an electrical engineer, designing motors and power systems. Two years after coming to America, Steinmetz patented a means of transmitting alternating current (A/C). It was the first of his 200+ patents in the US., most of them bought by the General Electric Company. 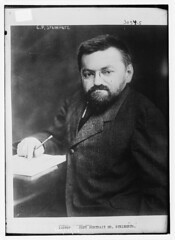 Steinmetz, a committed socialist, was also president of the Board of Education in Schenectady NY, and presided over the city council as well. He was an officer in the American Institute of Electrical Engineers. He also studied lightning at a campsite he built on the Mohawk River, and published a book of essays on science and religion. He was even responsible for ensuring that every orphan in Schenectady received a present at Christmas. From 1902 to 1913, Steinmetz was head of the School of Electrical Engineering at Union College. Today, the annual Steinmetz Symposium at Union College is an undergraduate research expo; there is also a Steinmetz Hall at Union College. A short recording of his speech, with film clips and stills, is on YouTube (with subtitles for his accented English). The IEEE has a Steinmetz Award for advancements in electrical and electronics engineering. Floyd Miller, The Electrical Genius of Liberty Hall: Charles Proteus Steinmetz (McGraw Hill 1962). Ronald Kline, Steinmetz: Engineer and Socialist (Johns Hopkins University Press 1998). North Carolina writer Reynolds Price died today, from a heart attack, just before his 77th birthday, according to a Duke University press release and the Charlotte Observer. Here's the birthday post we had for Price at DS,TU in 2007. New Guinean athlete Francis Kompaon turns 25 today. He's a sprinter in the T46 category of paralympic competition--he was born without a full left arm. At the 2008 Paralympic Games in Beijing, Kompaon won the silver medal in the 100m event. Besides the personal achievement, Kompaon had earned the first Paralympic medal ever for Papua New Guinea--in fact, the first ever medal for that country at the Olympic level, period. The PNG government awarded him with funding to attend college in Australia, where he can access better training facilities. Who would have dreamed one hundred years ago that this could ever be possible? Then the deaf were uneducated and widely scattered, unknown to each other; their influence, of course, was nil. --George T. Dougherty, at the 1893 World's Congress of the Deaf, as quoted in H-Dirksen L. Bauman, Open Your Eyes: Deaf Studies Talking (University of Minnesota Press 2008): 101. Born on this date 151 years ago, in Franklin County, Missouri, chemist George T. Dougherty. He was deaf after surviving typhoid fever at age 2. Dougherty attended the Missouri School for the Deaf, and then Gallaudet College, where he earned undergraduate and masters degrees. Dougherty's specialty was industrial chemistry, mainly working in the steel industry in Chicago. He devised processes for determining the nickel and vanadium content of steel, and the salt content of petroleum. 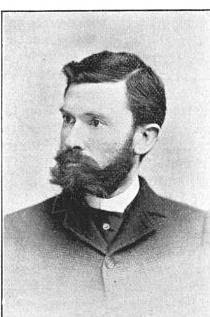 Dougherty was one of the founders of the National Association of the Deaf, chaired the World's Congress of the Deaf in 1893 (timed to coincide with the World's Fair in Chicago that year), and was a strong supporter of state schools and rigorous academics for deaf students (he and his wife were both state school alumni). H. G. Lang, Silence of the Spheres: The Deaf Experience in the History of Science (Westport CT: Bergin & Garvey 1994). Fina Perez, "Curriculum Guide for Discussing Deaf Scientists," Resources for Enhancing Science and Mathematics Education of Deaf and Hard-of-Hearing Students (website).